What’s the right sitting posture when working at a computer or laptop? Many of us that spend at least three hours per week in front of a screen. We would expect to experience discomfort as a result of doing three hours of exercise. Sitting still for this period also puts a strain on our musculoskeletal system and often results in lower back or neck pain. The human body is designed to move regularly, we evolved to hunt and forage, not to build a trap then sit and wait. In the modern world although our lifestyles have changed significantly from our hunter gatherer days, our muscles and joints still need movement to stay healthy and pain free. As occupational health Physiotherapists, we strive to achieve the optimum balance between the use of modern technology to maximise work efficiency and the toll it can take on the user, this is known as ergonomics. We assess individual’s working conditions and the tasks they need to perform and put in place solutions to maximise efficiency and minimise injury. Here are some general guidelines to help you at work if your jobs requires long periods sat in front of a computer. Take regular breaks to move as often as you can, setting a reminder on your computer to get up and walk around or stretch every hour. Your computer user chair should have a stable base (such as a five-star castor base) and a minimum of three adjustment features to comply with Health and Safety display screen equipment (DSE) regulations (1992). If you regularly work at a computer for more than one hour and your chair has not got these features, then we advise that you invest in one. These can be purchased from around £50 mark and it’s a good investment. How to set up your computer workstation correctly. The first feature to set is the seat height. Sit up tall on your seat, allow your shoulders to relax and let your elbows fall to your sides (not onto armrests). Adjust your seat height so your elbows are level with the desk surface. This is so you can keep your shoulders and arms relaxed when typing to help prevent neck pain and upper limb pain. If your feet cannot be placed flat on the floor you need a footrest. Unsupported feet is likely to result in strain in the lower back. If your feet can be placed flat on the floor, you do NOT need a foot rest. If you use a footrest when it’s not needed, you’ll probably be making your knees higher than your hips and this can flatten your natural lower back curve, which over time might cause lower back pain. If you cannot fit your knees under your desk with your elbows level with the desk surface then you need a higher desk or you will probably be slumping forward when working at your computer. Usually this can be achieved with putting desk risers (purpose-made small plastic or wooden blocks) under the desk feet. Next, raise the backrest so the curve of the seat fits in with the natural curve (lordosis) of your lumbar spine. If you are not sure where this is, stand up and run the back of your hand up and down your lower back. The apex of your ‘lordosis’ is the deepest part of the curve above your buttocks, this is more pronounced on some than others. Keep your hand on that point on your back and sit back down on your chair – this is the point to where you need to raise the curve of the backrest. You can also adjust the backrest tilt setting. There is no perfect position for this and this can be re-adjusted intermittently throughout a working day. 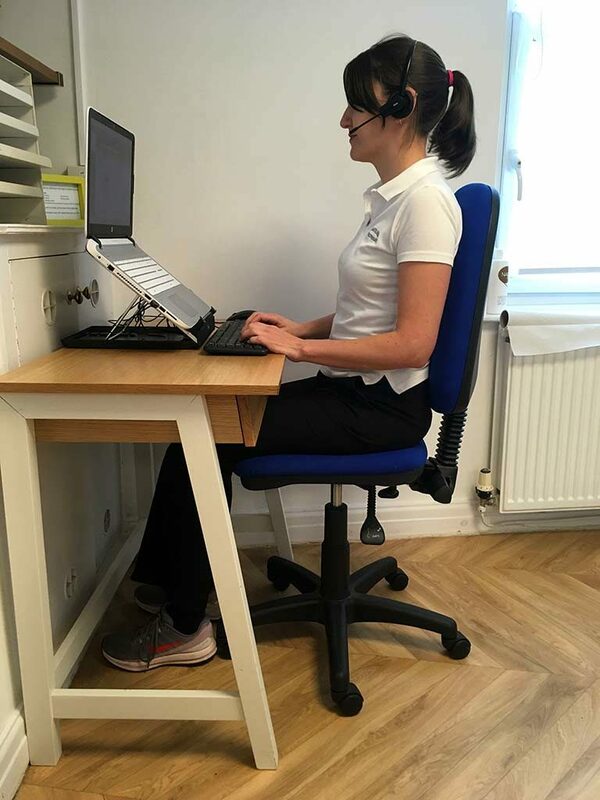 You can choose to be supported in an upright position whilst typing and you can recline the back for reading a document or from tablet or talking to someone on the phone. If you have armrests adjust these so you can position your chair close enough to your desk without overreaching. If you can’t do this, consider taking the armrests off your chair. After you have adjusted your chair make sure you are sitting square on to your computer, your mouse and keyboard are within easy reach if your elbows are relaxed at your sides and there is an equal balance of regularly used equipment and documents to both sides. MOVEMENT IS KEY – Make sure you stand up for 5 minutes in every hour and go for a short walk in your lunch break. If you have set up your workstation as advised above and are still experiencing difficulties, please contact us to discuss how we can help. Our occupational health Physiotherapist Nicola Jackson has been a member of the Association of Chartered Physiotherapists in Occupational Health and Ergonomics (ACPOHE) for 8 years and has vast experience of assessing all types of workplaces, from manufacturing plants and factories to high street banks and call centres.